Black and white photogrph of Massimo Iacopo Magi. 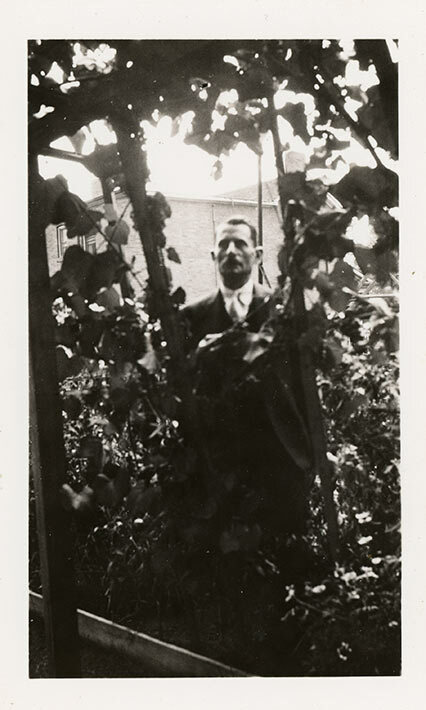 The photograph was likely taken in the summer of 1939, one year before Magi was arrested and interned, as it is very similar to a number of other photographs of him and his family taken outdoors in the family garden. The photograph appears to have been taken through a grape trellis. Massimo Iacopo Magi was born in 1884 in Limano, Bagni di Lucca, Italy. He immigrated to Canada and settled in Toronto where he was the co-owner of the Florentine Lighting Company. On June 10, 1940, Magi was arrested while at work. According to the RCMP, his arrest was due to his affiliation with the Fascio Principe Umberto, where he was the Secretary, and for overseeing the Toronto dopolavoro (after work) group. A number of his employees, including Ruggero Bacci were arrested along with him.